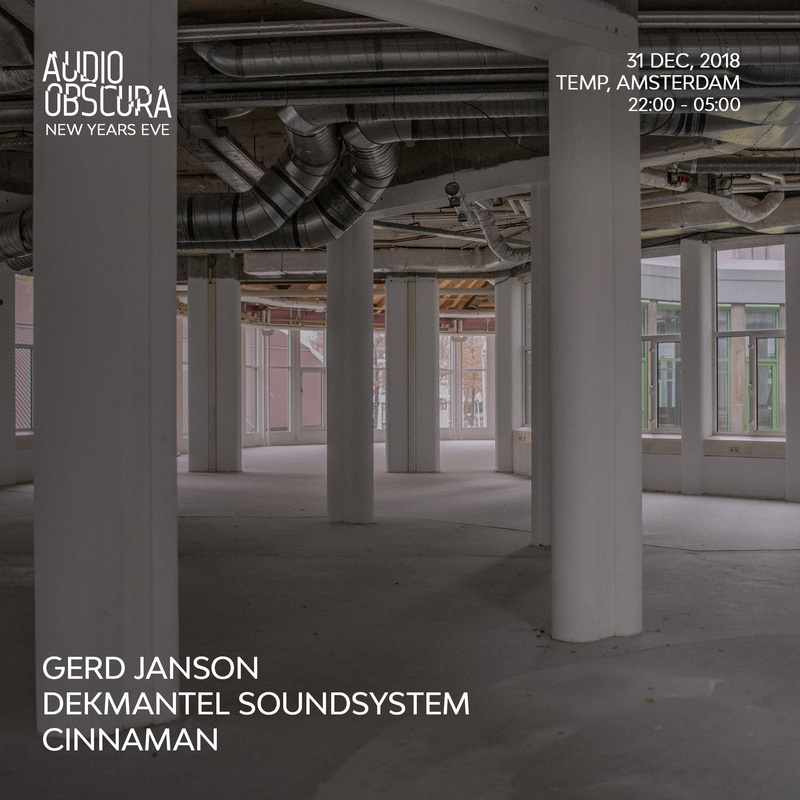 Continuing their pursuit for throwing events in Amsterdam’s most unusual and under-the-radar locations, event organization Audio Obscura now announce their vibrant and not to be missed New Year’s Eve party. Their NYE party takes place at newly opened venue temp., located in the south of the city close to the Olympic Stadium. This spacious old office building was previously used by the local municipality and has a stripped-back feel with dozens of windows and large pillars. Open only until April 2019, it follows in the footsteps of other temporary venues that have formed important parts of the city’s clubbing heritage. Local gem Cinnaman, part of the famous Rush Hour crew, will open the night with his wide-reaching variety of sounds. With a proven ability to cater to diverse crowds, guests can expect the unexpected with Cinnaman on the billing for this festive night. As the night goes on, Gerd Janson will take over. The Running Back boss, loved by many because of his unique perspective on the house and disco genre, will make sure you dive into 2019 the best way possible. This absolute pillar of German house music knows how to make the dancefloor come to life with his vibe inducing sets and will bring everything he got to celebrate the start of 2019. Just a few hours into 2019, Gerd Janson will be joined by the formidableDekmantel Soundsystem. This Dutch collective, headed by Thomas Martojo and Casper Tielrooij, will close off the night with a mesmeric set as is to be expected from the crew behind some of the most praised festivals and beloved underground labels out there. Combine this with the inclusive and energetic vibe characterizing all Audio Obscura’s events and you know that this is going to be one for the books. Don’t miss your chance to be part of another exciting chapter in Amsterdam’s club history. With Audio Obscura’s previous events in venues like the Rijksmuseum bicycle passage, the Loft in the A’DAM tower, Amsterdam Central Station and most recently the Scheepvaartmuseum all met with huge acclaim, you’re guaranteed a truly special party to bring in 2019. Gather your friends, this night will be nothing short of spectacular. The party runs from 10PM through to 5AM, with tickets on sale Thursday December 6 at 12:00 CET via Audio Obscura.